Operators of a 45-acre San Antonio solar farm have turned to sheep – not lawnmowers – as a low-cost, low-effort way to control overgrown shrubbery that might otherwise impede the company’s technicians. SAN ANTONIO — The landscapers at this 45-acre solar farm northeast of downtown do not complain that they are only paid in shrubbery. After about three months on the job, the bleating crew has kept the grounds in sheep-shape. Since April, the site’s operator, OCI Solar Power, has used about 90 Barbados-cross sheep as a low-cost, low-effort solution to controlling the overgrowth that would otherwise impede the company’s technicians. The 4.4-megawatt solar farm where the sheep graze is part of a series of 400-megawatt plants that CPS Energy, San Antonio’s municipal utility, plans to add to its portfolio by 2016. On average, a megawatt of solar energy can heat and cool as many as 100 Texas homes on a hot summer day. During average temperatures, it can power many times more. Sheep grazing is not a widespread practice at Texas solar farms, but it has been used elsewhere, particularly in California and parts of Europe. Contracting with a local breeder to bring sheep to a solar installation is cheaper than hiring two-legged groundskeepers, companies say, and easier than trying to maneuver lawn equipment in tight spaces. Sharing the land also helps the local agricultural economy, industry leaders say. 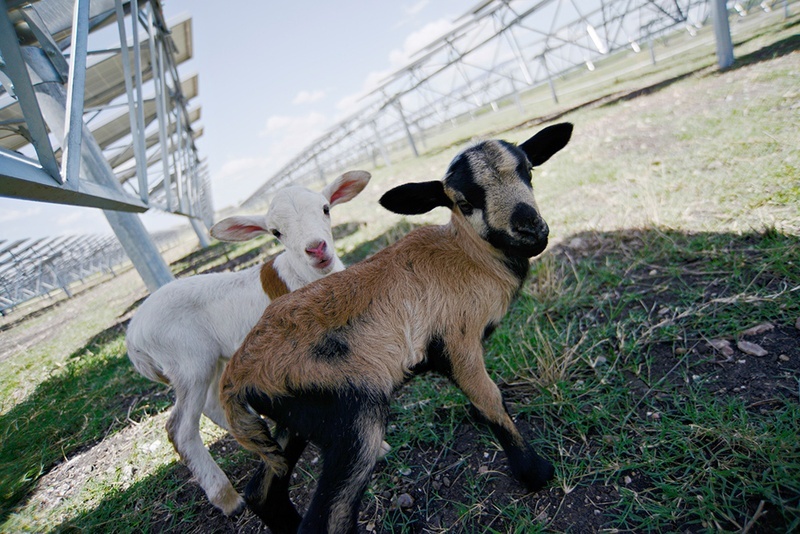 Sheep find shade beneath solar panels at the Alamo 2 solar farm in northeast San Antonio. Sheep grazing is not a widespread practice at Texas solar farms, but it has been used elsewhere, particularly in California and parts of Europe. Recurrent Energy of San Francisco, which recently signed a deal with Austin’s municipal utility to build a 150-megawatt solar farm in West Texas, said it had seen “great success” grazing sheep at four sites in Sacramento. “In the right type of location, there are many benefits that sheep grazing can have,” said Cate Powers, a Recurrent spokeswoman. First Solar, an Arizona-based company that is building a 22-megawatt plant in Pecos County in West Texas, said it had experimented with sheep grazing but had not done a cost-benefit analysis. At the San Antonio plant, which is home to thousands of solar panels, OCI Solar describes its grazing as an experiment that has worked well. The meandering sheep appear to have done their job; patches of grass reach no higher than a foot despite recent heavy rains. The sheep have not chewed on cables or jumped on panels, which goats — their equally hungry cousins — are more apt to do. The lone mishap thus far, Krueger said, came when one wily sheep sneaked through a gap in a locked gate. OCI staff members teamed up with a police officer and a local resident to corral the animal within 30 minutes. 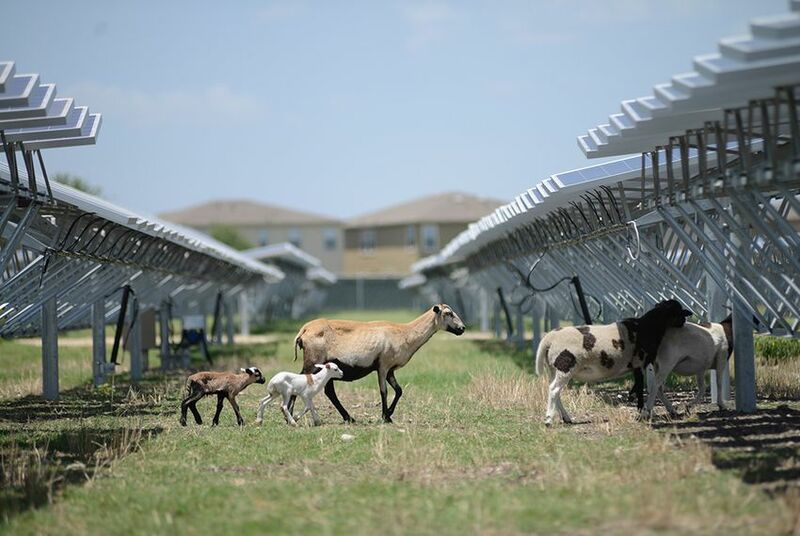 The sheep receive fresh water on site and can take refuge from the Texas sun beneath the solar panels, which extend several feet off the ground. OCI Solar recently unleashed additions to its grazing operation: two herding dogs, both Great Pyrenees mixes, intended to ward off coyotes. On a recent afternoon that topped 90 degrees, one of the high-energy pups spent half an hour bounding alongside a reporter and his hosts, showing more interest in getting belly rubs and finding shade beneath the solar panels than protecting sheep. The company plans to keep the flock of sheep on site for 10 months, at which point a Texas breeder will sell the sheep and bring in a new team. The company is also considering adding sheep at its much larger, 41-megawatt plant in hopes that the animals could cover all 500 acres.